Each line item in your site outline will need to be defined as an individual page, a navigational guide, a form, etc. 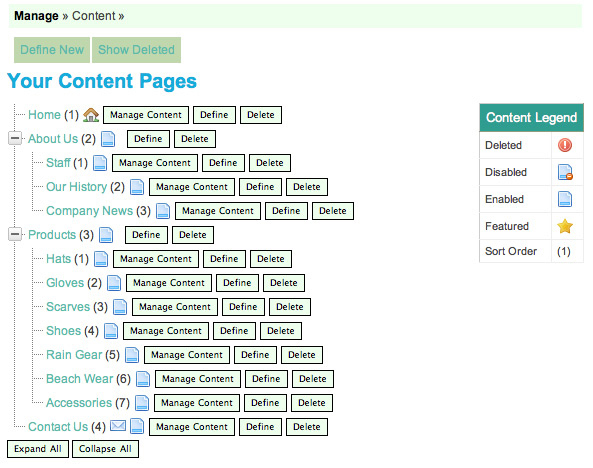 This is done by clicking on 'Define New' in your site manager for each item, one at a time. You will determine the page's content type from within there. For the purpose of this tutorial we will be using this sample outline laid out above here. Before you begin working in the Content Management System on your own site, make sure you have already laid out your own similar site outline. Let's look at our sample outline again. Notice this time that it is color coded. Some of the line items you see are pages (purple text) and some of them are strictly navigational menu directories (green text), a.k.a Menu Spacers. This flow chart displays the entire sample site structure branching from the navigation set forth above. If it will help you in designing your own site layout, go ahead and sketch out a flow chart of your own. Let's briefly discuss the first section that will progressively develop in the 'Content Area' called 'Parent.' 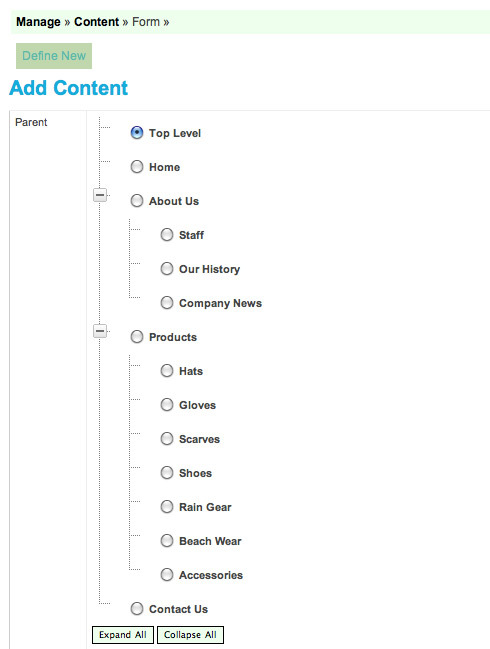 Every line item in your site outline will have a parent/child relationship with the other line items. See the outline below to fully grasp that concept. With that established, let's take a sneak peek at the section called 'Parent' in the final sample site layout. In the 'Define New' screens, we will build this structure. Below is what the Content management screen will look like when the site is all built. Now that you see it completed, you'll have a better understanding of what's to come.